Above is the State Highway 37 home destroyed by fire Wednesday. LISBON A GoFundMe has been created to help a Lisbon family that lost their home Wednesday morning. Teddy and Liz Harper own the State Highway 37 home. Lisbon firefighters responded but were unable to save the home. The page was established by Dana Olmstead. "We are asking for anyone who can to donate even the smallest bit to help raise funds to help our grandparents get back on their feet as they lost everything in a house fire this morning (1-16-19) any donations are greatly appreciated, thank you," the Go-fund me page says. 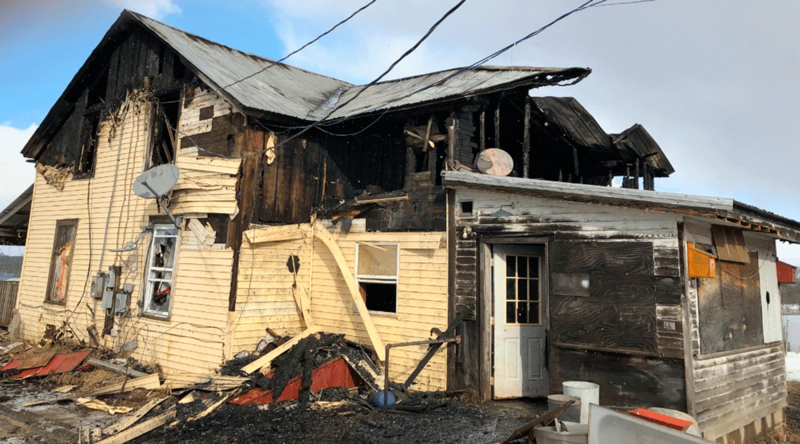 Volunteers from the North Country Chapter of the American Red Cross also provided immediate emergency aid to four people following the fire. The Red Cross provided financial assistance for necessities such as food and clothing to four adults. Volunteers also offered emotional support and comfort kits containing personal care items. In the coming days, Red Cross staff and volunteers will remain available to help those affected by the fire as they navigate the road to recovery.